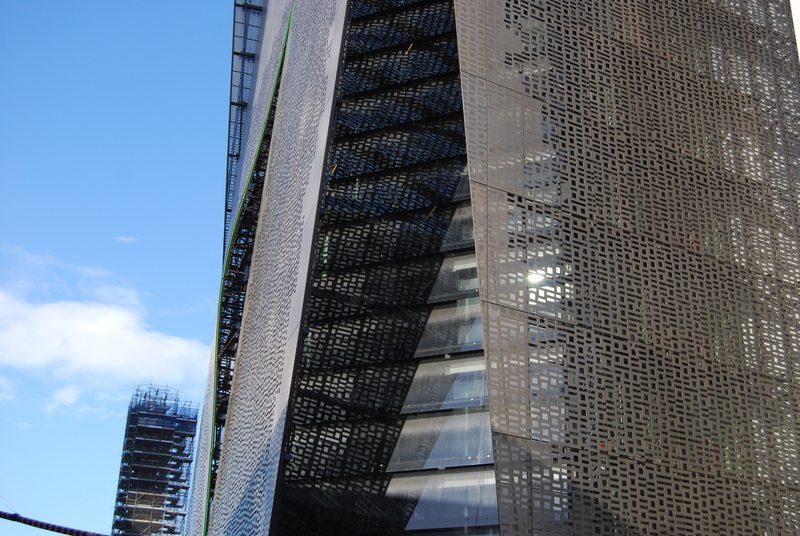 Piquing the interest of passers-by on Broadway since construction commenced in 2011, the dramatic, sculptural metal façade of the UTS Faculty of Engineering and IT’s new home is a future icon of Sydney’s city-scape. But a glimpse beyond the architectural and technical genius of the building’s public face – behind the impressive screens that spell out ‘University of Technology Sydney Faculty of Engineering and Information Technology’ in a rework of binary code – reveals a living, breathing structure set to transform research, teaching and learning. The building embodies UTS’s future-focussed Learning 2014 model, replacing traditional, large lecture theatres with smaller collaborative theatres and classrooms kitted out with cutting-edge technology. State-of-the-art labs and more informal learning spaces enhance the experience, and a crevasse-like atrium running through the heart of the building encourages spontaneous interaction between staff and students. The overall effect is to enable a more creative, organic and inspiring approach to learning. While much talk is around the show-stopping UTS Data Arena – an immersive 360 degree, 3D data visualisation facility that will change the way UTS uses data in teaching and learning practices – and the showcase potential of the Disruptive Technologies Laboratory’s holographic glass panels, the ‘wizardry’ of the building doesn’t end there. It’s also in the capacity of the floors, walls and roof to teach. Through a combination of over 3,000 individual sensors, researchers can access real-time data on the structural and environmental health of the building: 2,600 internal environmental sensors will measure everything from temperature, humidity and pollutant levels through to indicators of potentially harmful gases, while 300 sensors embedded in the concrete will monitor changes in the very fabric of the building, like the ageing of concrete reinforcement steel and the movement of support columns. For the Faculty’s Research Laboratories Manager Ray Clout, the building is the realisation of a wish list – a vision for a ‘living’ building explored in collaboration with the Dean of Engineering and IT, Professor Hung Nguyen. Ray’s passion for the technological brilliance of the new Engineering and IT Building is contagious. In a career that’s seen him develop a micro satellite for the Australian Government and watch it launch into space, it’s a big call to say that his work on the development of the new building is a career highlight – but it is. “I see this as a fantastic opportunity for me to leave a lasting and significant legacy for future researchers and students”, he said. Strain gauge sensors will measure the building’s movement and downward weight while ion selective electrode sensors will monitor the rate at which steel rusts and causes concrete to crack. The resultant data has the potential to be invaluable to the advancement of civil engineering knowledge and practice on a global scale, with comprehensive, ongoing information to improve building structures and inform future designs. The building communicates, but it also creates and renews. 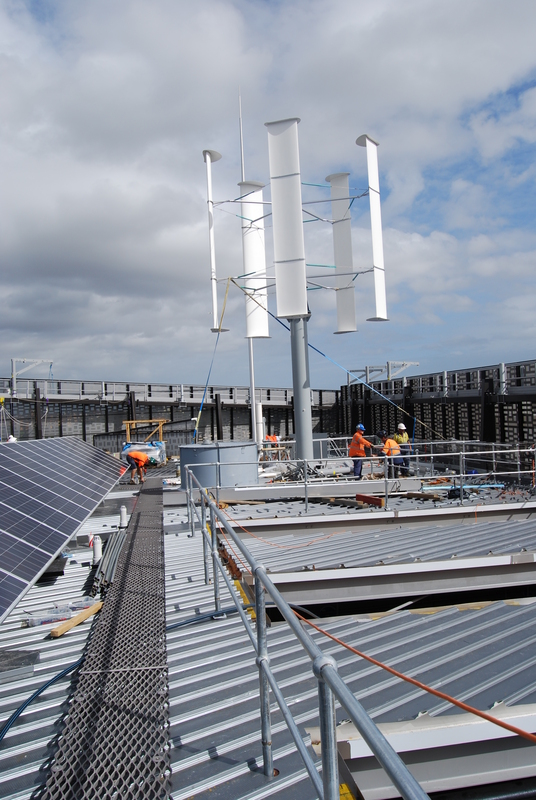 A roof-mounted wind turbine, solar panels and solar concentrating troughs feed into the building’s ‘micro-grid’, powering various laboratories and classrooms, the UTS ‘sky sign’, electric vehicle charging stations in the car park and hot water in some kitchens and common areas. “We’re also working on hydrogen cell vehicle recharge stations, so we are ready to support users as that technology becomes more common here”, Ray says. In the meantime, 288 new bicycle parking spaces will help staff and students to keep their travel impact light. In-built sensors will speak to the Building Management System (BMS) and Energy Management System (EMS), measuring conditions, counting the number of people in various spaces, and adjusting heating and cooling levels accordingly for significant energy savings. Even the external binary-coded screens are more than just a pretty fascia, providing shading that could reduce energy use by as much as 15%. Much of the technology that augments the building’s operation is pioneering and bespoke. The Co-Generation Plant – a cascaded system where waste hot water from each stage feeds the next stage of the plant to produce electricity, chilled water and domestic hot water – is the first of its kind. The custom-built Power and Electronic Control Centre – the nerve centre of the building – houses flow batteries that are still in the research stage in Australia. “We’ve translated designs that thus far have been only been on paper and in models into a real working system, and custom made it to fit our purposes”, says Ray. And it’s a unique and compelling test-bed to inform teaching and research as well – a fact that’s generating great interest from researchers in Australia and around the world. “Standards Australian and RMIT are also keen to use the renewables technology in the building as a model for development of a Solar Thermal Concentration Standard, which we don’t have here as yet”, he said. The single-largest project under construction as part of UTS’ $1 billion City Campus Master Plan, the Engineering and IT Building will be the first of the major buildings to open in 2014, with staff and facilities relocating from June and first classes commencing in Spring Semester. Our world-class facilities, innovative education methods and a building that is in itself a teacher and researcher mean we can look to the future with great anticipation. © Copyright UTS - CRICOS Provider No: 00099F - 07 September 2018 03:12 PM. The page is authorised by Deputy Vice-Chancellor and Vice-President (Corporate Services).